Shakti Mudra is good for inducing sleep. It helps those suffering from chronic insomnia by relaxing the body and fighting mental stress. Also this Mudra helps women during menstrual discomfort. It relieves tension in the pelvic area and prevents spasms in the intestines. To practice Shakti Mudra: Join ring fingers and little fingers as indicated. Fold index and middle fingers loosely over thumbs. Then gently tuck thumbs towards the palms. 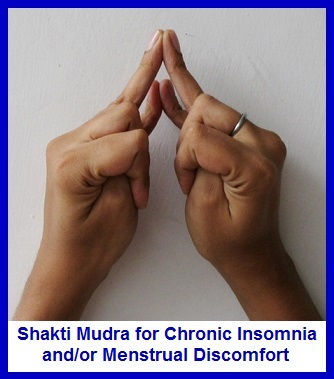 For chronic insomnia: Sit on bed, close your eyes and do Shakti Mudra for 10-12 minutes. Slowly, feel the physical and mental tension melting away. When finished lie down. It’s beneficial to practice this Mudra every night before retiring. For menstrual discomfort: Close your eyes, practice Mudra 10-12 minutes when needed.